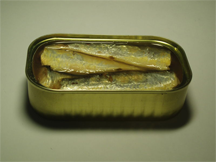 A can of sardines — what many of us feel like on board a modern airliner. Recently, Airbus reportedly studied a "Standing Room" class in which passengers would be strapped into standing racks. When we converse, in meetings, in hallways or cramped into those tiny seats in coach class, we sometimes want to change the subject. Or maybe we usually want to change the subject. And sometimes we want to stick to the subject, when someone else doesn't. Here's Part I of a catalog of tactics we use to change the subject, and some tactics for preventing the change. When you have the "conversational ball," people assume that you'll continue with the current thread. Pretending to be unaware of the thread frees you to change the subject. This is especially useful when the latest contribution was an uncomfortable question. Sometimes, when people haven't yet agreed on the subject, this tactic is actually a way of negotiating the subject. It's also used in reactive mode, to resist the attempts of others to change the subject. When the distribution of power among the participants is fairly uniform, you can defeat this tactic by politely but firmly repeating what was apparently missed. Humor helps. But when your partner has a power advantage, resisting can be risky, because your partner almost certainly has more effective tools available. Pretending to receive a mobile phone call. Most people assume that someone who suddenly answers a mobile phone that wasn't "ringing," is answering a phone that had been set to "vibrate." But that's an assumption. The call might be real — or not. Summoning a server. This distraction is useful in restaurants, at parties, waiting for parking attendants, or whenever servers are present. If your attention is required by the distraction, as it might be in the case of a summoned waiter, waitress, or wine steward, resisting the distraction can appear to be rude. Nevertheless, try to maintain your hold on the conversational thread. When the distraction ends, steer the conversation back to your topic of choice. more than diversionspart of orderly discourse. The key phrases to use are permission-seeking: "Can we look at something else for a moment?" or "I have another matter I'd like to discuss…"
Changing subjects by agreement can be (paradoxically) contentious, especially if the parties have an asymmetric power relationship, when the "agreement" is achieved by implicit coercion. But whether or not coercion is involved, it's usually wise to accede to the request — if you ever want others to honor your own requests. Would you like to see your comments posted here? rbrenkwboAVvdapPFJwIzner@ChacgJHvlPxanLHnGJjKoCanyon.comSend me your comments by email, or by Web form. I offer email and telephone coaching at both corporate and individual rates. Contact Rick for details at rbrenUBUOnBaKJfwAhckAner@ChacuVujoDuTsfZNBAxdoCanyon.com or (650) 787-6475, or toll-free in the continental US at (866) 378-5470.